Extend USB 1.1 signals up to 275 feet via Cat5. DISCONTINUED: please see USB2Pro for a related USB Extender solution. 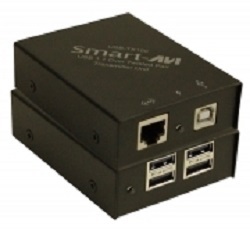 SmartAVI’s USB100 extends standard USB (Universal Serial Bus) 1.1 signals up to 275 feet away from your CPU using a single CAT5 unshielded twisted pair cable. The USB100 is capable of transparent data transfers at 1.5 and 12 Mbps.